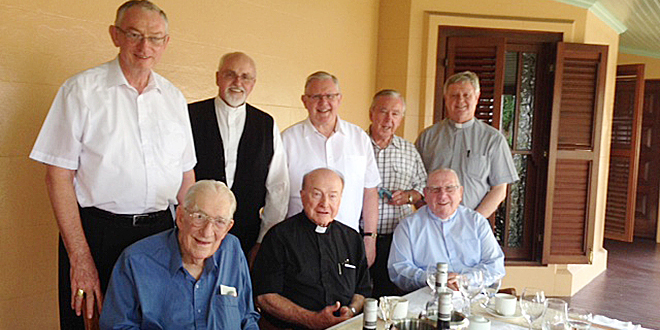 Brother bishops: Gathered at Wynberg, New Farm, recently are (back from left) Bishop Michael Putney, Bishop Joseph Oudeman, Archbishop Mark Coleridge, Bishop Brian Heenan and Bishop Brian Finnigan; and (front) Bishop Ray Benjamin, Archbishop Emeritus John Bathersby and Bishop John Gerry. 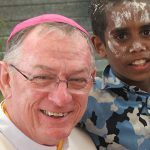 Townsville Bishop Michael Putney, with these and other words as 2014 opened, communicated to his fellow priests the latest stage in his journey towards death and everlasting life. Early last year when the 67-year-old bishop received the diagnosis of stomach cancer that had spread to his liver and was inoperable, he started on a remarkable new phase of his life. How long he had to live was unclear but some indications were it could be a matter of months. Far from withdrawing from his ministry, he entered into it with a deeper zest, enhanced sense of mission and, above all, peace that God’s will was being done. 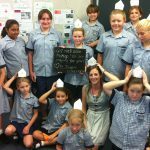 This attitude engaged and inspired not only his own diocese but also the wider Townsville community, which had come to know, love and respect the religious leader during his 12 years as bishop. When The Catholic Leader spoke with Bishop Putney, this same enthusiasm and serenity was clear. 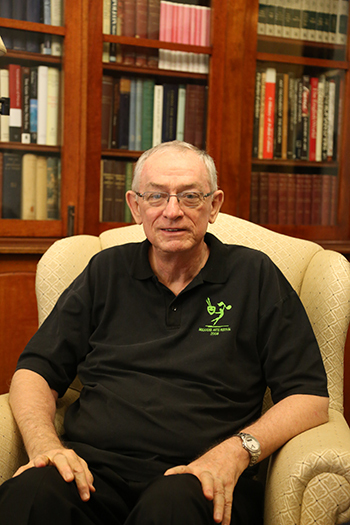 Peace and purpose: Bishop Michael Putney during his recent visit to Wynberg at New Farm. “People may be a little bit shocked to know that I wouldn’t have missed last year for anything,” he said. “And it’s because of the grace of God … His grace has been very tangible in my own personal life. “Also in the things I have tried to do and others have done with me. 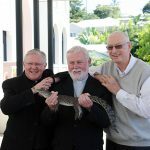 Townsville’s bishop was staying at the Brisbane Archbishop’s residence Wynberg following an invitation from his old friend Archbishop Mark Coleridge. Bishop Putney was delighted to report having been part of a “wonderful gathering” of Queensland bishops at Wynberg several days earlier. It was also an opportunity for Bishop Putney to catch up with his various family members around Brisbane. Later that day he was lunching with nephew Michael and family. So there was a sense of farewell in his Brisbane stay. 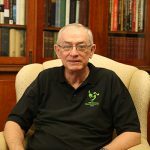 Indeed much of Bishop Putney’s past year had been comprised of farewells – he had stepped down from his role as Catholic co-chairman of the International Methodist/Roman Catholic Dialogue due to ill health. This would have been the beginning of his 25th year in another five-year phase as co-chairman. He was to have flown to Atlanta, Georgia, for the annual meeting of the group but his immune system, compromised by chemotherapy treatment, meant he could not. So last year, he said his farewell to the group via Skype. No doubt such events carried some sadness. Yet, as the interview with Bishop Putney progressed, there was also a sense he was continuing to look with optimism to the future, inspired no doubt by the blessings received in 2013, “one of the most amazing years of my life”. “In 2013 the Church was celebrating a Year of Grace … it was in fact a year of grace for me,” he said. “God’s grace flowed abundantly into my life. “People have been praying for me, thousands of them in fact, in many parts of Australia and indeed overseas. Bishop Putney said some of this new fruitfulness had come through his own changed attitude brought on by the doctor’s diagnosis. So what had the bishop’s first thought been when he received the diagnosis? Had he had any premonition after his check-up that he might have a serious illness? “I said to a priest friend that this could be cancer and he thought that was a silly idea,” he said. “Even my GP didn’t expect it. “I couldn’t say I was expecting it but I didn’t rule it out. “So when the doctor told me I had cancer I said: ‘Okay’. “Then I thought of St Paul in Philippians where he says: ‘To live is Christ and to die is gain’. I thought, oh well I’ve been trying to live my life serving Christ and if this is the next thing I’ve got to do that’s all right too. “I’ve never had a moment of darkness … it’s been this incredible grace of acceptance and readiness for whatever comes. What has he learnt from the illness? “Certainly a great respect for the public health system,” he said. “I’ve been on trial drugs only available in the public health system, so I’ve been able to witness the caring and professional standards of doctors and nurses in that system in Townsville. “The other thing is when you’re told you’re going to die you have the chance – I think it happens almost automatically – to relive your life. “It all comes back to you both good and bad and I’ve had the consolation of hundreds of people making contact to speak of the good things that were part of my life with them. This merciful aspect of God has been foremost in the bishop’s mind since his sickness, in a way it never was before. “I have always these past 10 years spoken endlessly of God as love,” he said. “Now I’m thinking a lot more of His mercy. 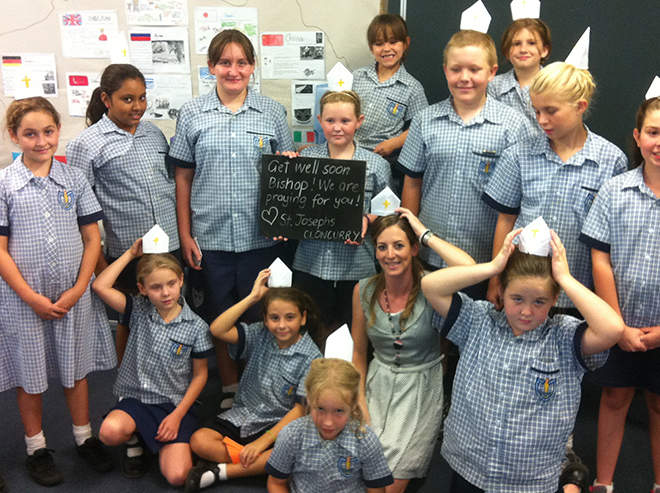 Message of love: Year 5 students at St Joseph’s School, Cloncurry, and their teacher send a get-well message to Bishop Putney after news of his cancer diagnosis. Bishop Putney has also looked beyond his own illness, insisting his diocese not only pray for him but also for all cancer sufferers. He also talks of a prayer network of which he is part and of promising to pray for those suffering from the disease brought to his attention. He said his journey with cancer had been covered widely by the media and hoped others may benefit. “Other people with cancer are watching and some of them tell me they are encouraged by my peacefulness and my positivity and so on,” he said. “I try to say every time I’m interviewed that I’m very conscious that I’m privileged because I don’t have a wife and children … someone with cancer who’s got a family around them feels a much bigger burden than I do. “Therefore it’s easier for me to accept death than it is for someone who would be leaving behind a grieving spouse and children. 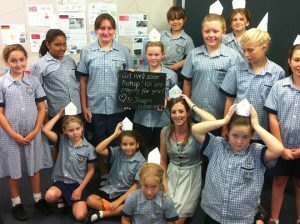 Support since the diagnosis has been “massive”, Bishop Putney said. “The diocese has supported me enormously across the board – priests, people, religious – both with their prayers, thoughts and encouragement,” he said. This support would come as no surprise to observers of the bishop’s ministry. Bishop Putney has been involved in everything from Townsville’s ecumenical annual Walk of Witness for Christian unity to attending the city’s annual V8 Supercars event. At last year’s Walk of Witness, representatives of the former National Council of Churches came and planted an olive tree to mark the bishop’s contribution to ecumenism. Bishop Putney described the tree-planting as “very powerful and moving”. The visit of Australia’s new apostolic nuncio Archbishop Paul Gallagher and Queensland’s bishops to Townsville last year was another highlight of the bishop’s “year of grace”. “The bishops met here then spread out and visited parishes on the Sunday for Mass, and the diocese’s people were thrilled they did that,” he said. It was also hoped to take the new nuncio to one of the wildlife sanctuaries to meet the animals. “But,” Bishop Putney said, “it would have taken too much time, so we had someone bring the animals to us so the visitors could meet the northern creatures. Given such wonderful surprises, the bishop said he was looking to 2014 with optimism and trust. “Like all years, my diary is already half full of events which in this case I may or may not be able to do,” he said. “My major focus this year will be carrying forward my plans on New Evangelisation … the idea is to have certain parishes act as ‘lighthouses’ for other parishes. In terms of his health, Bishop Putney said: “I am not sure if, when and how quickly the cancers will continue to progress. “So I once again begin the year facing a great mystery about what lies ahead,” he said. He also explained the reason for his supreme confidence as he faced this great challenge. “The rock I stand on is not me nor medicine but God,” he said. 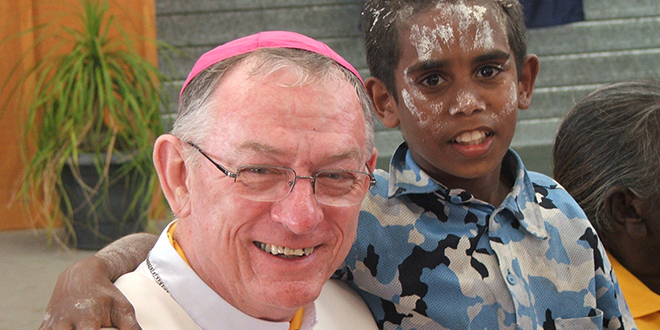 Reaching out: Bishop Michael Putney with a Palm Island youngster during the visit of the World Youth Day Cross and Icon to the island in 2007. 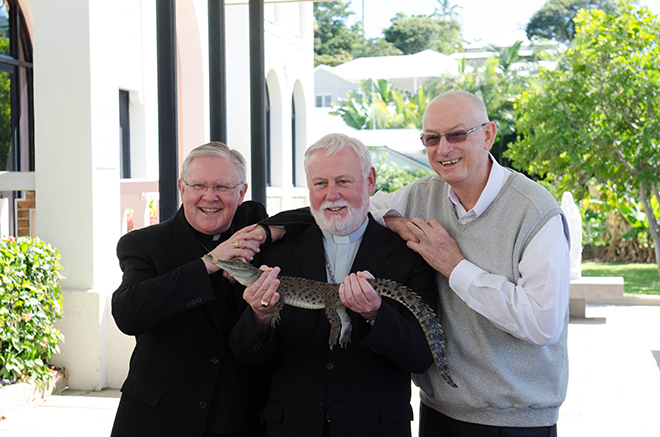 Smiles for crocodile: Brisbane Archbishop Mark Coleridge (left), apostolic nuncio Archbishop Paul Gallagher and Bishop Michael Putney inspect a crocodile during last year’s bishops’ gathering in Townsville.